The cold assaulted my skin the moment I opened my front door and stepped out into the pre-dawn. That last four letter thought was actually another four letter word which I don't need to repeat here. The door locked, I fumbled my keys into my backpack (really should have spent some time finding a hat and gloves), plugged in my music and set off to work. It was just after 6.30am, two degrees celcius, and I was off on my first post-knee injury walk to work. The first 20 minutes were along my darkened road where other than the occasional person huddled in bus stops, and the lights of passing cars, I basically found myself alone with my thoughts, trundling down the road in my daggy t-shirt and shorts wondering why I felt so cold. Just as I cut off into the bush, the sun started rising and there was a wonderful crisp, crunch to the air, and for that matter the ground as I found myself tromping through ice encrusted grass and watched the sun rise in a cacophany of purple and orange colours. With the rising dawn, the temperature dropped further and I found myself gingerly making my way down the steep tracks and byways to the bottom of Proctors Road. My stopwatch ticked over to 45 minutes as I came out of the bush, a full 15 minutes slower than my pre-knee injury time. The walk didn't get any faster as I cautiously made my way over a frost coated metal walkway and past cars encrusted in thick coatings of ice. It was a full hour and twenty five minute walk to work in the end, 25 minutes longer than normal, and I probably added another 10 minutes to my shower in order to defrost myself when I got there. After pumping up two very flat tyres on the road bike following four months of storage, I headed off to try out my new GPS Contour Camera on a ride out to the airport and back, thinking I could do a nice easy 40-45km to see how the legs held up on the bigger gears of the road bike, but 35 minutes into the ride I discovered that even at Standard Definition a 2GB Micro SD card will only last ... well 35 minutes. So I switched the camera off and decided to follow what I thought was the "50km" Big Ride Route instead, except I didn't realise that the 50km route didn't do the circuit around the airport, so my ride ended up being closer to 70kms. Today (Sunday), I headed down to Huonville to compete in the Derwent Cane Club Huon Winter Series Race. They bumped the distance up to 15kms for this race, and like last time I pretty much got left behind at the start line (really got to lose weight and build up fitness) and from there it was just a matter of keeping up a tempo. The race had four seasons in one day from bright, blinding sunshine right through to swooping wind squalls and near torrential rain, but overall the conditions were kinder than the previous race (ie. no persistent headwind) allowing me to average 9.6km/hr as against 9.0kms/hr in Race 2 despite the extra distance. Only real achievement for the day was on the way back, just after coming out of the canal at Franklin, I started the chase for two paddlers about 100 metres in front of me, but after 3 or 4 kilometres I conceded that I just couldn't reel them in. I had never got closer than about 60 metres. Then as I got past the end of the Island, I recalled watching Paula Findlay's last race on television this week, and Jill Homer's recent blog on the need to push through the pain and thought "bugger it" there's only 2km to go - CHASE. I stepped up the tempo, and chased. I chanted to myself as each stroke cut into the water. I didn't go for technique or rhythm, I just went for forward movement. I chased through the pain of a forming blister, I chased through arm and back fatigue and slowly, oh so slowly, I started to reel them in, metre by metre, foot by foot I reeled them in. It was only at the last corner, probably 400 metres from the finish, that I finally caught and passed the guy in front of me, then I gave everything I had for the next 100 metres and just got onto the back of the front paddler, but unfortunately I then hit the side of my boat with my paddle, alerting him to my presence and being much fresher than me, he was able to sprint over the line and beat me by six seconds. I still finished in 1:32:04 and as I say, very pleased with the 9.6km/hr pace. More importantly, I was on a high from the chase. I'm sure I was meant to be a dog in this life (happiness found through chasing things). What I learnt today was that determination and grunt can take you a lot further than you think, but ultimately without the fitness that comes from training, sometimes it just can't take you quite far enough. 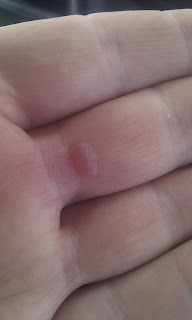 Sometimes all you get for the effort is a blister. Still, a good weekend. A very good weekend. My bike light illuminating the darkness before me. "I want you to stop riding and start attacking"
Those were the words my physio uttered to me, just before he pushed me out the door and said "and I don't need to see you anymore." OK, not better "better": I still have a sore knee, and can expect aches and pain for anything up to another year, but my knee's are now both strong enough to take it, and in the words of my physio, there wasn't much more he could do for me and it was now time to attack those climbs. I must have read his mind because the night before (as per these two pics) I had ridden home via the bush tracks that wend up between the Mt Nelson Steps and Proctors Road. 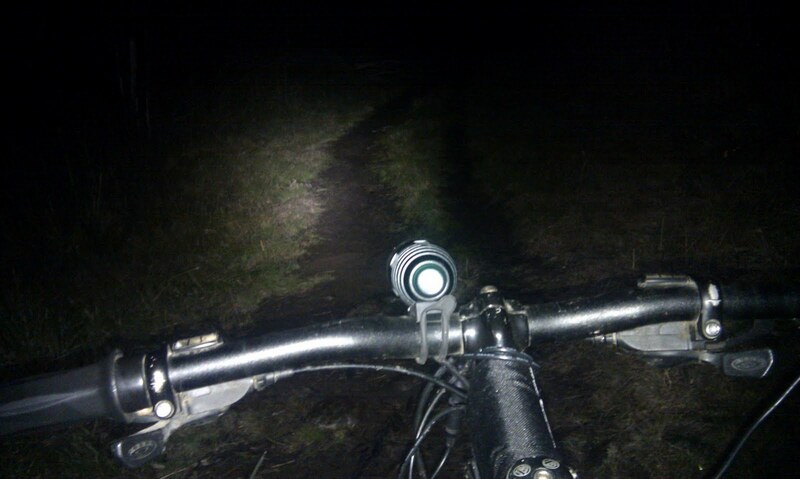 It was a tough ride in the dark and cold across slippery, wet mud and over rocky, steep ground. I didn't have the fitness for the climb, but it was good anyway, and I had attacked it. Tonight, I rode home via the Mt Nelson Bends and I was up out of my seat every time the hill got steep. I overtook three other cyclists going up the bends (but I do acknowledge the electric bike advantage). Still it was good to get up out of the saddle and attack. Really good. Today I went off to hide from the world, or more exactly to hide from a sadness and loss that I had to face this weekend, but wasn't quite prepared to. My plan, if you can call it that, was to go somewhere I shouldn't, somewhere I'd never been, somewhere where the challenge and uncertainty of the situation might drown out that which I didn't want to face. Somewhere I could stand on a mountain by myself and scream YAWP! to the world. If your first thought is Butlers Gorge? (Read: Where?) Then that was exactly the reason why. By way of background, several years ago I noticed on an old 1:25000 series map that there appeared to be a track along the edge of Lake King William from Derwent Bridge to Butler's Gorge Dam, and so I had headed off to explore it from the northern entrace at Derwent Bridge to see if it was still there. That plan was stymied before I even got the bike out of the car by a "Private Property - No Trespassing" sign, and I pretty much forgot about the idea until my recent need to go somewhere new, and my idea to try it from the southern end. So I set off early this morning, more nervous than excited given I had no idea if the track would even be there, or if it was whether it would be signed keep out, I had no idea how my knee would hold up to potentially 50kms of track riding having done nothing more challenging that cycle to and from work on my electric bike since my knee surgery, and all this when the whether forecast was cold with colder winds and my headspace wasn't the best. Yea, that wasn't what I was looking for, and flicking through my music as I headed out towards New Norfolk nothing seemed to have enough oomph to rev me back up again. I pulled into New Norfolk about 6.40am only to find that the subway didn't open for another 20 minutes. Two strikes. 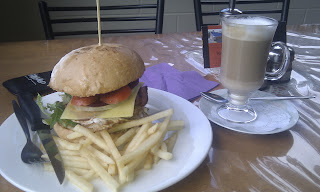 I seriously considered hanging around, but figuired I'd gotten up early as I had a big day, so hopped across the road to Banjo's and inflicted a bacon and egg roll and chai latte on myself. I just thought of it as energy and ignored the taste. An hour and a bit later, as I turned off the highway to head down the last 16kms of dirt road to the dam, I noticed I had a text from Bec. I stopped and checked it to find that my cousin Ben had injured his elbow and was heading into hospital for surgery. Great. I finally pulled up at the boat ramp, and braced myself to step out of my nicely heated car. Is it just me, or is this one of the hardest parts of any ride - the transition from warm car to cold bike? The temperature was every bit as cold as it looked, and the kindest word you could use to describe the wind was "bracing", but I got my layers on, put the bike together for the first time in four months, turned on the GPS and, looking rather ridiculous, jumped on the bike and headed off into the unknown. The first kilometre or so of the track involved a few stops stripping off gear as I warmed up, and trying to get the feel of the bike again. I took a turn off from the main trail (following the line on my GPS) abut 2kms from the start and wound around a beautiful bit of older track, before quickly dropping back out (somewhat disappointedly) on the main track I'd just left. From there the track wound its way around the lakes edge, and I was just soaking up the lake misted in by clouds on my left, and all the glorious colours of the eucalypts highlighted by the rain that ran down their trunks. In fact for the next 11kms, the track was flat easy riding as it variously kissed up against the lake shore, wound through eucalypt forests, over headlands, across creeks and under powerlines. There were Bennetts wallabies everywhere, and although it was an old double lane track the whole way it was glorious riding, and the cold and damp was very easy to ignore ... though riding this in winter, my shoes were soon soaked and my feet a tad cold. About 14kms from where I'd started, at a section on the map where no tracks had been marked, the track dumped me out into a big open bay. I searched arund for a bit, crossed a small creek, and then deciding that I must have missed a turn off, made the choice to just head inland until I crossed the track, a feat that turned out to be much easier said than done. 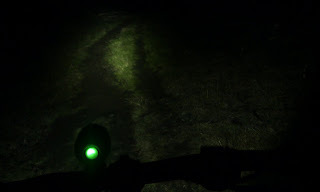 I carried my bike over my shoulder as I pushed through waist high reeds, often covered in snow (I was at around 800metres) until I had crossed under the power lines and well across where my GPS indicated that the trail might be. It was about this time that I realised that the reason there was no track marked on my map, could well be because there was no track, and so after conferring with my GPS about where there might be a track, I decided to head back to the open bay and see if I could pick up the track on the other side. The crossing of the bay was not for those with a fear of wet feet (something I'd much earlier abandoned) or more importantly a fear of quicksand. My GPS reassuringly told me that I was walkoing through where the lake usually covered (though obviously hadn't for a long time), and there were sections of the bay where it just felt like if you broke through the thin reeds on top you'd just go down and keep on going. I had images of someone later finding my backpack beside a hole in the ground and made mental preparation for how I would use my bike to stop sinking if I did go through. About half way across (it was roughly a kilometere in a direct line) the ground got really dodgy, so despite having located a power line in front of me which I was heading for, I decided to head back towards the relative safety of the shoreline and wend my way around that way, perhaps adding a few hundred metres to this slow detour, but certainly increasing my peace of mind. That's where I'd come from - feeling lonely out here. beautiful though, if given the choice I'd go this way again. Made it, time to change GPS batteries. I came across a few vehicle tracks as I got in loser to sure, and so started to loosely follow these for a while thinking they'd lead me out. However, after leading me well past where I had intended to head for the power line, I decided this was a bit fruitless and pasued for a break and to change my GPS batteries which had gone flat in record time which I put down to a poor charge. After a muesli bar i decided to retrace my steps and follow my original route to the powerlines and sure enough found a substantial track underneath them. My confidence soared, as this middle bit was the section I had been worried about. The track quickly took me to the bottom of a short, but very steep section (which I pushed) up and over a ridgeline, and then equally quickly back down again on very rough, technical riding over large loose stones. At the top I could just see Lake St Clair in the distance surrounded by snow covered peaks hiding in the clouds. I think it took me nearly 40 minutes to push my bike up and over this little section, and so when I got about 2/3rds the way down the other side, and found the "expected" (in that I had seen it on google earth) turn off onto a gravel forestry road which I knew would take me out to the highway. I looked briefly at what looked like a very muddy and not fun alternative which continued to push down the hill, and opted for the safer, gravel road. To justify this decision, I assured myself if I came across a later turnoff which I'd seen on my map which would allow me to reconnect with this little trail and arrive in Derwent Bridge quicker, then I would take this turn off, come what may. Come what may, came (I had been confident it wouldn't be there) so I somewhat reluctantly pointed my front wheel down it and plummetted down the side of the hill. How grateful am I that I did. The gravel road turned into a beautiful section of trail running through woodland, and after 30kms of seeing no one, I had the surreal experience of passing a lady out walking her two young kids. She assured me that I was almost out on the highway, and 200 metres later that's exactly where I was. In fact I emerged right out behind that sign that said "Private Property - No Entry". Who knew? It had taken me around 3 hours to get here, and I pulled into the cafe and ordered a hot latte and a chicken burger (which was huge) to warm me up and replenish my energy supplies and surfed facebook and took a few calls whilst I looked out the window at the wind howling through the trees. I had cycled from Butlers Gorge (Clark's Dam) all the way to Derwent Bridge - YAWP! I unforuntately had to now cycle back again (sigh due to sore bum). Despite my desire to get back, I couldn't bring myself to cycle past the Private Property sign, so instead heading along the highway for a couple of kilometres back towards Hobart until I picked up where the paved road entered the highway and retraced my way up the hill to where I had left the road to start with. At this point despite the temptation of taking the easy path, and having extremely cold, wet feet, I just had to explore the section of trail I didn't ride on the way out, so I took the right hand turn and headed down the road, for the second time, and almost all of the way back into Derwent Bridge - effectively covering about 6kms to go 700 metres and avoid a "No Entry" sign. The section was worth it, as it ran through some beautiful bushland, and the ride/push back up the hill wasn't that bad, and in fact if I hadn't had my knee problem I think I could have cycled a fair way up. However, the push back to the top did have the advantage that it warmed up my feet, which by then were two icicles at the end of my legs. The descent down the other side was much faster than the ascent, and I even managed to ride across the wet, slippery, loose rocks down the bottom. In fact before I knew it I was back at the point where I had originally rejoined this track after crossing the bay and heading off into new territory to see where the track lead to from this end. The answer is inland, and up. Probably if I wasn't so unfit, and making so much effort to spin and not stress my knee, the up bit wouldn't have been noticable, but I noticed it, and so despite this section being through some more great eucalypt forest, I was getting to the fatigued stage and couldn't enjoy it as much as I would have liked. That said, the section was beautiful and obviously rarely visited as there were many downers and broken limbs across this section whereas the rest of the trail had been virtually free of such obstructions. there was also one creek crossing (knee deep when I crossed it) and after about 4.5kms it dropped me back out onto my outward bound track, around 12kms from the start and 1.5kms from the bay. I had in fact notcied this track on my way out, but as it had a large branch across it, and my GPS showed a trail heading off into the hills and stopping I had ignored it. I have to admit, coming back out onto the track I knew wa like coming home. I was even greeted by a big wombat waddling across the track in front of me. A further 3kms along the track from this junction, just as the track re-merged under some powerlines, there was a small track heading down towards the lake , and what looked like a road that actually ran along the lake. I couldn't resist the temptation to explore, and was amptly rewarded as I found myself on what must have been an old trail before the lake was flooded leading to some sort of building, who knows what as only the concrete foundations remained. Riding along this track wasn't easy, but it had a surreal sense to it as I cycled through a barren landscape of rocks, orange clay and dead trees along what once must have been covered in water. I even got enough energy up to do a few log jumps, though admittedlythey were very tentative. I found my body was in a constant battle between cold and fatigure and the joy of being able to be there. it wanted to play and collapse at the same time, and I had what seemed to be a rapidly reducing ability to guide it. I eventually rejoined the track I'd come out on, until parrot corner (named by me because of a stuffed parrot strapped to a tree) and followed what I thoguht was a second section of road along the shore line, but which had long ago washed away. I managed to ride about 30% of it, and had to carry my bike the other 70%, but it was still kind of fun and I'd go that way again. From there, the fatigue battle started winning out and although I still enjoyed myself, I had nothing left in the tank and found myself getting off the bike and pushing up hills which I really shouldn't even have noticed. Right towards the end I found myself pushing up a hill that must have had only a 3 or 4% grade. I was done. Seven hours and 50kms after leaving, I pulled back alongside my car, scrambled out of my wet clothes, jammed on the heater and pumped up the radio. I was absolutely exhausted, and downed two cans of pepsi max on my way back out to the highway. I felt like I had found that mountain top to scream from. It had been an amazing day, and importantly, I'd almost forgotten the demons I was running from. 100 Miles in the Tasmanian Antipodes.